A golf break in Ireland is guaranteed to be an absolutely unforgettable experience. There is no doubt that the country is littered with some of the world's most fantastic golf courses, offering some of the purest golfing experiences, but the landscape is also adorned with many top resorts and hotels. Ireland is rated 4.8 out of 5 based on 82 verified reviews from YGT customers. They played and stayed (we even checked they signed their scorecards). Surrounding the lively and attractive capital of Dublin are numerous golf resorts offering spectacular countryside settings. If you fancy a bit of history and culture during your trip then Cork and the Blarney Stone is a must visit along with some wonderful layouts like Old Head and Fota Island. Breathtaking scenery and spectacular courses can be found in the South West, Killarney is a tranquil and serene retreat of unimaginable beauty while the likes of Ballybunion, Lahinch and Tralee provide incredible golf. The North West may be slightly remote but it provides exceptional golf, Ballyliffin and Rosapenna are great traditional links, with fantastic scenery and of course great hospitality. Last but certainly not least is Northern Ireland, base yourself in the thriving capital city of Belfast and experience the wonderful layouts of Royal County Down, Royal Portrush and Royal Belfast. Visiting the K Club's Ryder Cup complex, and the incredible resorts at Carton House and Druids Glen, not only will you experience the phenomenal courses, you will also understand Ireland's reputation for its warm welcome and legendary hospitality. While the golfers battle the famous Irish elements, fellow travellers can enjoy the first class leisure and spa facilities that the best golf break destinations ensure. With 28 daily sailings over 4 routes on the Irish Sea why not swap the stresses of airline travel, pack the clubs into the boot and travel over to Ireland with Stena Line ferries. Ireland generally plays host to one tournament each year on the European Tour: the Irish Open. The event enjoys one of the largest galleries on the European calendar, highlighted by the 2012 edition held at Royal Portrush, which attracted a record attendance of 112,000 over the four competition days. The Irish Open moves around the country’s top courses, with Portmarnock Golf Club hosting the tournament on an unprecedented 13 occasions. The 2014 edition was won by Finland’s Mikko Ilonen at Fota Island. In addition hosting the Irish Open three times, Mount Juliet has hosted the American Express World Golf Championship in both 2002 and 2004; the earlier of which saw Tiger Woods set a tournament record of 25 under-par. Other tournament venues include the Heritage Golf Resort & Spa (2007 Seve Trophy), Druids Glen (2002 Seve Trophy) and the K Club, which played host to the 2006 Ryder Cup. Inspired by a courageous performance from our very own Darren Clarke, Europe crushed the US side 18.5 to 9.5 on the resort’s Palmer Course. Royal Portrush in Northern Ireland remains the only Irish venue to have hosted the Open Championship. It is strongly tipped to do so again in 2019 after being added to the current rota. 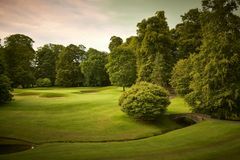 Druids Glen is home to two parkland gems, one of which is ranked among the best inland courses in the country, and a top class hotel that serves as the perfect base for tour of Dublin or simply a top value weekend trip with a group. Carton House is a similar prospect, with two vastly different courses (always a winner with societies) located within 40 minutes from Dublin. One of the real hidden gems of the Emerald Isle is the unheralded Rosapenna Golf Links. Situated on the north west coast, these two outstanding links courses are simply spectacular. Not recommended for the faint hearted, but if you ask any Irish golfer for the best layouts in the country, these two will definitely feature. Whether you are looking for relaxation or a spot of romance, there are few better settings for it than Ireland’s gorgeous countryside. The award-winning restaurant and spa at Powerscourt Hotel caters perfectly for couples with its brilliant facilities, stunning scenery and close proximity to Dublin (25 mins). Mount Juliet, situated just a short drive south from the medieval city of Kilkenny, is another beautiful hotel offering comprehensive facilities. Set in raw Irish countryside, Adare Manor offers the full 5* experience with the added convenience of easy access to Killarney town and its selection of restaurants and bars. Many of our Irish venues offer Golf & Spa packages, meaning there is something to keep both you and your partner entertained. Dublin is the obvious and best choice for night time entertainment in Ireland, with countless bars and pubs crammed into the city centre. There are a huge selection of venues located within a short drive of a the capital, headed by Portmarnock Hotel & Golf Links which is just 15 minutes from the city and only five minutes from Malahide with its bars, restaurants and nightclub. If venturing to the north, the Hilton Templepatrick Hotel & Country Club is only 10 minutes from Belfast and while it’s a 5* venue, it’s certainly fantastic value for money. In the west, the Killarney Plaza Hotel is situated bang in the middle of Killarney in walking distance of all the town’s bars, pubs and restaurants, and is a great base to access the wealth of brilliant golf courses in the area. For a luxury golf break in Ireland, it’s hard to look past the K Club Golf Resort & Spa. As one of the finest resorts in Europe, if not the world, with its two championship courses, Ryder Cup pedigree and top-end 5* accommodation, this really is a bucketlist venue for the serious golfer. Fota Island Golf Resort & Spa is situated in a beautiful corner of County Cork and boasts a picturesque 27-hole golf course with lots of water. This is very much a new age 5* venue with the highest quality rooms, dining and spa facilities. The Heritage Golf Resort & Spa is another top-class 5* destination and a popular wedding venue due to its quality, with a fantastic spa and championship golf course designed by Seve Ballesteros and Jeff Howes.